Clay minerals are highly reactive due to their large surface area and because they commonly carry an ionic charge on their surfaces. This forms the basis for their ion exchange capacity and the rate at which water causes the clay particles to swell. The various layers of clay particles have a deficiency in interlayer ionic charges. The ion exchange capacity of the clays is the property by which clay minerals attract available ions from their surroundings and retain them in an exchangeable state. These ions can be exchanged with other cations and anions during treatment from ions in a water solution. These ion exchange reactions generally do not affect the structure of the clay mineral. Ion exchange is important because the physical properties (e.g., plasticity) of clay materials are frequently dependent on the exchangeable ions carried by the clay. The plastic properties of clays, for instance, are highly dependent on whether Na+ or Ca+2 are the exchangeable cation. It is, therefore, possible to alter the plastic characteristics of many soils to meet their specific needs by carrying out specific ion exchange reactions. The water in the volume of pores and capillaries, called the absorbed water requires very little energy for its removal (e.g. drying at only a little above room temperature). The water around the edges of the discreet clay mineral particles, in addition to the water on the pore surfaces is called the adsorbed water. 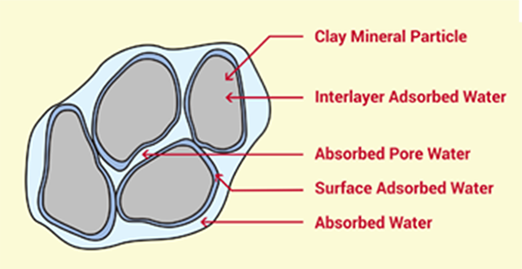 The interlayer water (adsorbed water), controls the swelling of clay. Adsorbed water requires definite energy for its complete removal. Clay particles, when suspended in water, can be considered to be surrounded by a hydrosphere of adsorbed water, within which is contained soluble ions of different charges. Around the ultimate clay particle are layers of negatively charged ions (due to the fact that oxygen makes up the bulk of the composition of the silicates), and these are balanced by a swarm of exchangeable cations, which are diffused throughout the hydrosphere. These "counter" cations provide links between the clay particles which as a result develop plasticity. Plasticity is associated with the formation of adsorbed water films of a certain order of thickness around each particle, and is thus a function of the water content. The maximum plasticity of clays is developed at specific water content, which corresponds with a film around each particle of approximately 2,000 Angstroms thick. For most clay, this would be in the water content range of 15 - 25% by weight. An attempt to compact such material will cause an overall reduction in grading, which will result in a further increase in plasticity. This is due to the development of hydrostatic pressure within the material during compaction. The question, therefore, is how can this adsorbed water be removed permanently? The answer is with GRAVELOCK. The removal of adsorbed water in order to achieve maximum density with less mechanical effort. (GRAVELOCK as a compaction aid). To prevent the re-adsorption of water. This results in a permanently stabilized construction material. (GRAVELOCK as a stabilizing aid). Compaction, as such, can easily and much more economically be achieved by the use of a variety of relatively cheap compaction aids such as a diluted sulphuric acid or even caustic soda. The problem with this treatment is that the soils will not be stabilized permanently and will re-adsorb water (After the first rains), thereby causing road failures. GRAVELOCK is a complex chemical formulation, of which one of the active ingredients is a sulphonated oil. The permanent action of this sulphonated oil depends on the presence of other active compounds, which enhance the effect of water dispersal in clay materials and produce a permanent association between GRAVELOCK and the clay particle. This formulation of active compounds makes GRAVELOCK unique in chemical constituency, behavior and end results, when applied as a compaction aid in road construction. Sulphopnated oils are surfactants (surface active reagent) and have this character due to the duality of their chemical constituency and behavior. A sulphonic acid moiety (Which consists of two equal parts and is referred to as the hydrophilic "head") is completely soluble in, or miscible with, water and insoluble in most non-polar organic solvents. This part of the molecule dissociates when the oils disperses in water and produces an anionic SO3- group, which is linked, via the sulphur atom, to the so called "tail" of the molecule. This "tail" consists of an assembly of carbon and hydrogen atoms and is completely insoluble in (immiscible with) water, therefore, referred to as the hydrophobic "tail". It is lyophilic in nature - miscible with oil and non-polar solvent - strictly due to its hydrocarbon character. Despite the difference in nature of the two parts of the molecule, it is soluble in water, as well as in organic solvents. This dual behavior of the sulphonated oil is utilized as a means to disperse water from minerals. As discussed earlier in this document, clay minerals consist of layers with a variety of loosely associated ions, adsorbed on their surfaces. In an aqueous environment, these ions move freely in the hydrosphere surrounding the clay particles and exchange positions at random. Most ions are solvated (surrounded) by a number of water molecules in such an environment and therefore enhance the hydrophylicity of clays. The large quantities of water and the mobility of cations and anions in a clay water system will produce undesired plasticity. In order to reduce the plasticity, it is necessary to reduce the mobility of ions in solution and secondly to liberate as much water as possible from the system. GRAVELOCK provides a simple, inexpensive chemical solution to this problem. Treatment of material with GRAVELOCK provides the chemicals required to reduce ion mobility and to repel water from the clay minerals. 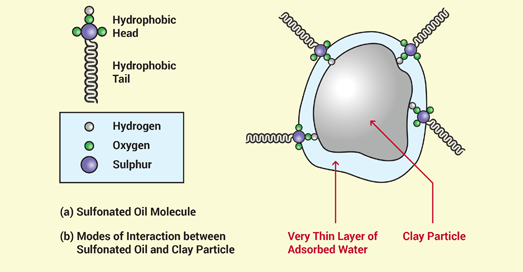 The hydrophilic head of the sulphonated oil forms chemical bonds with the surfaces of clay particles, both on the external surfaces and on the planar surface (Figure 2). Direct chemical bond formation between the SO3- anionic head of the oil and a metal cation on the surface. These bonds are relatively strong. Inductive bond formation between an uncharged oxygen atom of the SO3- group and a metal cation. Occupation of a vacant ionic site on the clay surface by the sulphonated oil. The hydrophilic head of the oil dissolves in a very thin layer of water adsorbed on the clay mineral surface. Cations, which otherwise would have been highly mobile are now fixed in their position and are "sealed off" by the sulphonated oil molecules. This also prevents the ions from forming solvation complexes with water. Once the oil molecules have formed their associations (of whatever nature) with the clay particle, the hydrophobic tail is directed away form the planar surfaces to form an oily, protective layer around the clay particle and also on its under layer surfaces. Naturally, water would be repelled by the hydrophobic tails, to such an extent, that virtually no mechanical pressure is required to liberate the water. In the absence of the chemical, up to 420 kg/cm2 mechanical pressure is required to force interlayer water out of clays. Compaction can now be achieved with a minimum of mechanical effort and clay particles are brought into a very close association with each other. The natural density acquired, as well as the hydrophobic layers surrounding the clay particles, prevents water, in small quantities, from re-entering the system. Compaction and permanent stabilization can be achieved with minimum mechanical effort, producing a base in which particles are bonded simply by direct contact. Clay particles having their inner walls coated with a hydrophobic layer, allow for the free movement of water. This means that water in the soil of a road can move freely in the GRAVELOCK treated material. With natural evaporation, this free water evaporates from the system more easily and hence increases the stability of the material. CBR Plus North America Inc.
19233 69A Ave., Surrey. B.C. V4N 6K4.